Kabir Singh First Look Poster is Out, Shahid-Kiara's Film Teaser Coming on April 8! Kabir Singh First Look Poster is Out, Shahid-Kiara’s Film Teaser Coming on April 8! Shahid Kapoor and Kiara Advani is all set for his upcoming release Kabir Singh. Directed by Sandeep Vanga, it is an official remake of 2017’s super hit Telugu film Arjun Reddy that was starring Vijay Deverakonda and Shalini Pandey. The poster will leave you even more desperate for the teaser to drop out. Shahid will be playing the role of an alcoholic surgeon in the film. This poster shows the actor hidden in darkness with a statoscope around his neck and he’s smoking cigarettes too. The story is based on a man who goes into a self-destructive path after his ex marries someone else. 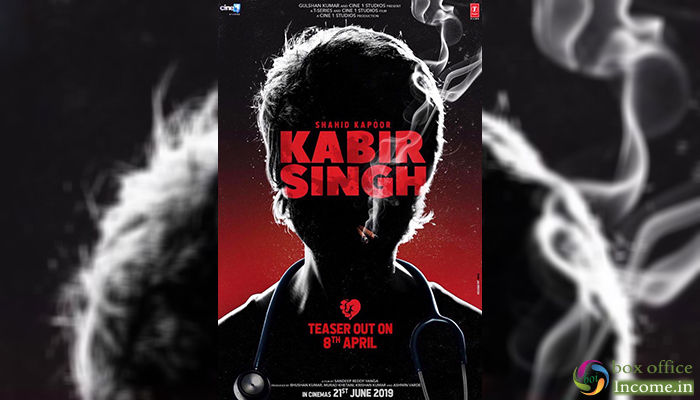 After the first look, now fans are excitedly looking forward to the official teaser of Kabir Singh which is all set to hit internet on April 6th, 2019. The flick which went on floors in August will hit the big screens on June 21, this year.